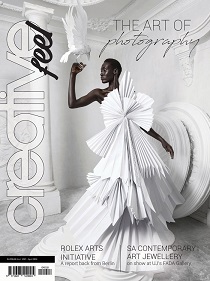 Creative Feel‘s stunning April cover is taken by acclaimed photographer Justin Dingwall as part of his latest solo exhibition, Fly By Night. This month Creative Feel is celebrating mentorship following the eighth cycle of the Rolex Mentor and Protégé Arts Initiative in Berlin where new mentors and protégés were announced. The issue takes a look into the SA Contemporary Jewellery Awards Exhibition at FADA Gallery and delves into UJ Arts & Culture’s #Metamorphosis. Also at the FADA Gallery, and curated by Renée Mussai, is Black Chronicles IV, a touring Autograph ABP exhibition, hosted by VIAD in collaboration with UJ Arts & Culture. There’s news that the Playhouse Company will present Gibson Kent’s legendary musical play, How Long, which is to be staged in the Playhouse Opera from May 2 to 27, 2018. The issue also celebrates collaboration, innovation and secondary ideas with The Centre for The Less Good Idea, creating a culture of excellence with Artscape Theatre Centre, and remembering a musical icon with Joburg City Theatres who will honour the life of Hugh Masekela and his contributions to musical theatre in a celebration concert.